Big box retailer may help local man get on the shelf. Storrs man hopes Walmart shoppers will get his sandballz on the shelf. Walmart is looking to find the best new products and George Kronen, of Storrs, thinks sandballz are what the company is looking for. He invented the clay balls that are filled with sand and salt thathis Web site says are a safe way to sand and salt walkways and driveways after a snow or ice storm. You throw the ball to put sand where you need it. Walmart's Get On The Shelf campaign gives small business, entrepreneurs or inventors a shot at winning a spot on its store shelves nationwide and virtual space at Walmart.com. Kronen hopes that Walmart likes his invention. If you like Kronen's invention, you can vote for him. The first round of voting runs through April 4. You can buy sandballz at Eagleville Food Mart in Storrs. 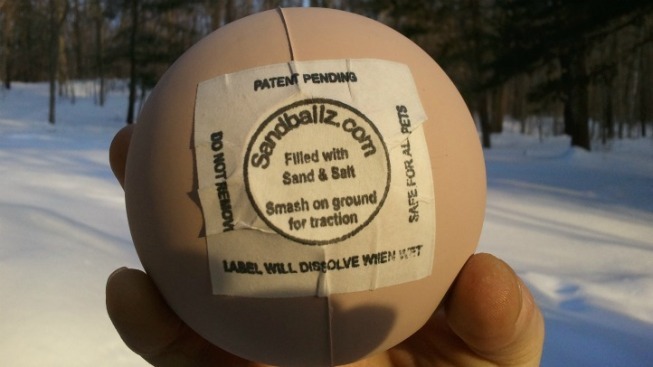 The sandballz are biodegradable and non-toxic, safe for all pets and animals, according to the Web site.